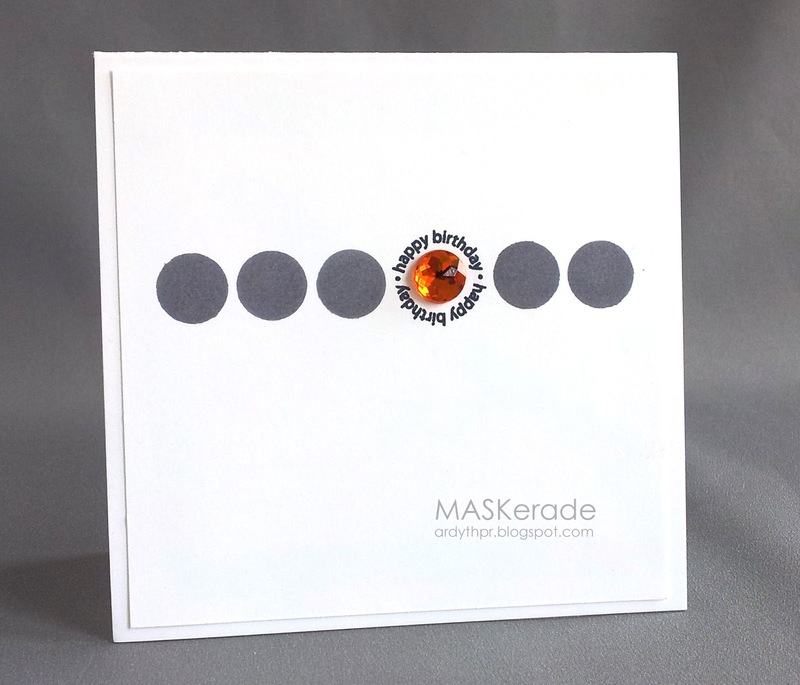 MASKerade: CASE Study 197 - Happy Birthday! CASE Study 197 - Happy Birthday! I find orange and black hard to work with. Somehow it always screams Hallowe'en to me. So I looked back at Pamela's to figure out why hers wasn't screaming Hallowe'en. And it's because (in my humble opinion) the black isn't black. Because she's used vellum, it's grey. But it shows black around the orange dot because of the way the vellum is cut. AHA! I can't remember where that little circle sentiment came from, but I'll hold onto it forever because every once in a while, it's really useful! The bigger dot is from Simon Says Stamp and the bling is Doodlebug. Oh my goodness... i LOVE this Ardyth! What a great card. Love it! I really like the simple layout and the pop of colour inside the sentiment. Brilliant....ha ha! Wow there can't be anything cooler and simpler than this :) love that big gem stone ! I'm not seeing anything even remotely close to ghostly here! The bold pop of bling looks great! I think I have that same sweet hb sentiment...that looks like it was made especially for the orange jewel! Great CASE - love your interpretation. Our school colors are black/orange so I have to use them all the time. I love how you used the gray. When I saw the rhinestone I thought of my birthstone (topaz). You could swap this out for any birthstone. Fabulous take on the inspiration. You are the best at being inspired by a piece, yet taking it in a very different direction. It's fabulous! This is perfect Ardyth - love the orange bling! wow...this is shear perfection in a card! I love it. I really, really, really, really love this card! Perfection! so perfect, Ardyth! LOVE it! Brilliant! You are the Queen of CAS Miss Ardyth! SO clever! Fabulous card. And, no, this does not say Halloween to me at all. Love that cute round sentiment. Wow another great card love it. Thanks for joining us over at case study. That little stamp sure came in handy! So cute! This orange and grey combo is one of my all time favourites and I love how you've used it. The little bit of bling is just perfect to draw your eye along.